“Me, please,” would probably be the standard answer to this question from most online slots players, so when presented with a game called ‘Who Wants to Be A Millionaire’ you’re probably expecting a slot based on a lotto winner or a rich banker living in a huge mansion. 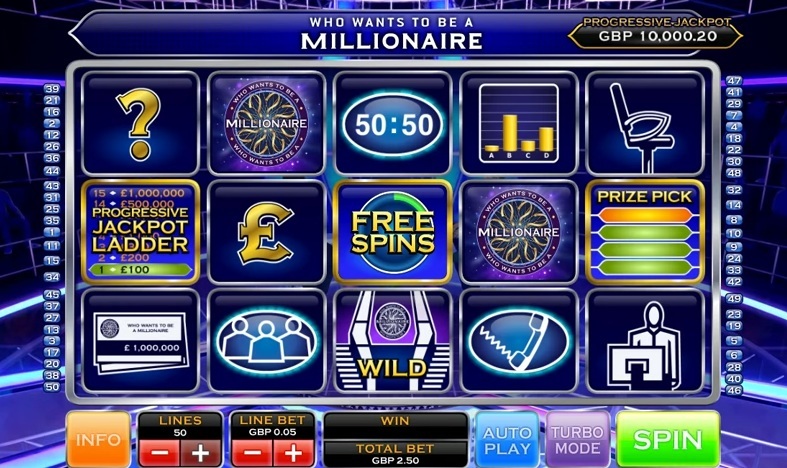 Who Wants To Be A Millionaire is actually a 5-reel, 50-payline online slot adaptation of the global phenomenon TV game show from Endemol. It has been translated into umpteen versions in countries across the globe, has inspired a Hollywood blockbuster (Slumdog Millionaire) and has produced millionaires everywhere it has been shown. By the way, there is also another Who Wants To Be A Millionaire? slot by Big Time Gaming, which should not be confused with this one. Now it’s the slots world’s turn to come up with a version, and Ash Gaming’s slots version is a pretty effective attempt. The famous theme music is present here, as is the familiar blue neon colour scheme of the TV studio. And, as you’d expect from a big-name TV tie-in there are bonus rounds aplenty to sink your teeth into. Three or more Free Spins Scatters anywhere triggers a free spins round with Shifting Wilds which line up to give you more wins, while three or more Prize Pick Scatters anywhere triggers an in-reel Instant Win cash prize bonus. In terms of icons, the game has plenty of recognisable images from the TV show: the 50:50 logo, the black chair, ‘Ask The Audience’, ‘Phone a Friend’, the quizmaster, a cheque for £1 million, a Pound sign, a Question Mark, and the show logo itself. The TV studio icon is Wild and substitutes for all icons other than the Scatters. Five Wilds on the reels pays out a lovely 5,000-line bet jackpot. The free spins bonus round triggers 10 to 20 spins, depending on how many triggering Scatters you landed in the first place, while Shifting Wilds appear on the reels during the round and substitute for every other symbol. These shifting beauties will move one reel to the left between each spin until they disappear off the reels altogether. It’s in the Progressive Jackpot Ladder where things get exciting, however. 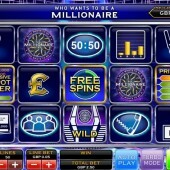 Depending on how many triggering Scatters you land on the reels you win 3, 4 or 5 free advances on the jackpot ladder. You will get to ‘answer’ the quiz questions (which effectively are a progress or ‘collect’ option) but you can use lifelines to remove ‘collect’ answers. This brings a neat little element of the TV show into the game. A potential $1 million jackpot can be won if you select the right quiz ‘answers’ from the choices on each question. Great payouts, nice bonuses, and a juicy progressive jackpot; there’s enough in WWTBAM to attract fans of the show and newbies alike. There's no need to ask a friend whether you should be playing this; just fire up the laptop and find the game today. And if you’re into a spot of TV gameshow adaptations on the slots, check out Ash Gaming's reality tv-themed Britain's Got Talent slot or Deal or No Deal - The Banker's Riches from Endemol Games.